Posted on January 26, 2015 at 11:10 pm. Here at Mockingbird Headquarters, the 12th man is in full swing ready for this Sunday’s game. And yes – we’re going to tie online legal marketing to the Big Game. 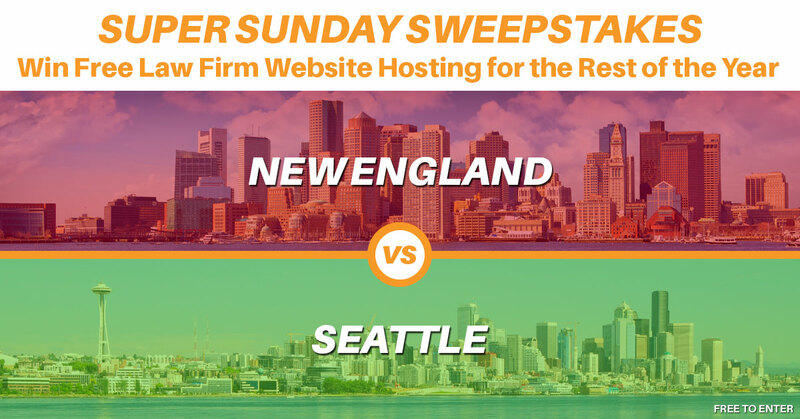 So – to the winning city of this Sunday’s NFL match go the geeky spoils: 10 Law Firms receive free hosting for the rest of the year on the best of breed WPEngine. Personally, these are my two favorite teams – as a Seattle resident and Sherman fan, I have to support the Legion of Boom. BUT. I was a grad student at Michigan when Brady played (granted Lloyd Carr sat him during his senior year – a precursor of 15 years of Michigan coaching errors, but I digress . . . ) My in-laws live in West Barnstable, I attended Colby and my first post-college job was in Worcester – essentially, I’m a New Englander at heart. We promise to refrain from utilizing phrases like “we’re deflated” or “pumped up” to needle (oh sorry) my Boston brethren. We love the Seahawks and the Patriots (at least I do). Despite running marketing for 50 law firms across the country and a strong relationship with the your amazing LOMAP office, our footprint in New England is underrepresented. Sites hosted on WPEngine are lightening fast. They specialize exclusively in WordPress. They backup your site daily – reducing the downside of WordPress hacks. They are based in Austin, TX – Seattle’s hot weather doppelganger. Yes – $29 is more than 3 times normal hosting costs, but the downside of a bad host is considerable – see list above. No – you must be a customer of one of those website providers who fleece their customers to the tune of $750+ a month. Hope you aren’t on their proprietary platform too. Entry starting at noon on Monday, January 26, 2015. Entries must be received by Saturday, January 31st, at 5:00 pm EST. Prize includes website hosting on WPEngine from February 2015 through December 31, 2015. There are ten prizes total. Prize Value of each prize is approximately $618 for both hosting (11 months at $29) and site migration (one time fee of $299). Winners must have an existing website built on the WordPress platform OR build a new WordPress site. This prize does NOT include the design, development or configuration of a new website. This prize does NOT include the upgrade, migration or change of any non-WordPress site onto the WordPress platform. Migration of existing websites will be performed by WeMoveWP – and will be completed by the end of February. WeMoveWP is solely responsible for website migrations. Winners are responsible for website hosting on January 1, 2016 – and available prepaid monthly at a retail rate of $29 if they select to stay on WPEngine. Migration away from WPEngine is NOT included in this Prize. Winners will be selected randomly from the winning location; one from each of the following Practice Areas. If there are no entries in a particular Practice Area an alternative winner will be selected in an additional Practice Area. Winners will be contacted via phone and email by Tuesday, February 3rd, 2015. This sweepstakes is only open to law firms with physical headquarters in Connecticut, Massachusetts, New Hampshire, Vermont, Washington and Maine. One entry per law firm. All entries must include a domain currently owned by the law firm. Enter at Mockingbird.Marketing.com/super-sunday-sweepstakes. Entrants are required to provide: Firm Name, Contact Name, Phone Number, Email Address, primary Practice Area and existing domain owned by the firm.